SUBMIT YOUR REFERENCE FOR A-Team! We want to thank Tim for his professional skills and knowledge in building our lovely new ADA bedroom and bathroom addition. He has been a pleasure working with in the entire process. Thank you so much A Team. Everything looks great with the fascia and gutters. IAlso, I am very pleased with the way the deck turned out. I like the fact that you moved the stoop and put the deck under the door instead having it start after the stoop. Like I said on the phone, it's better than I imagined. Good Work. I am looking forward future fruits of your labor. 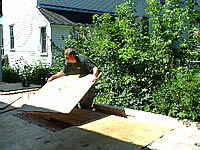 If you are looking for a professional company to do your roof. Call these guys,the not only did an excellent job, they are friendly and keep a clean work enviroment. I would hire them again for my next project. Thank you again for your quick response and the excellent deck you built. We love it. Good job with the hayloft, there may be some work later this winter. I appreciate all your help. You definitely relieved a ton of stress and pressure for me. I look forward to additional projects soon. Thanks for getting the bedroom done. It looks good. Jim and I thank you very much for a job well done…and if you need any recommendations let us know, we would give you an excellent recommendation. Your work is excellent and you are very easy to work with which is very important-and always kept us updated. – Thank you for job well done. I am more than happy to write a recommendation letter for A-Team and personally for Tim Spry. Let me start with the history of the project. We have a large barn attached to the house and decided to insulate two of the rooms in it, to replace windows and doors and bring heat. My main concern was that the barn is very old -- it was built before 1879. I called several companies to get estimates for the project. Since my field of expertise is far from construction I needed not just the price tag but also an advice on how to better accomplish the task. Having heard many horror and *rip off* stories about contractors from my colleagues and friends, it was not easy to make a choice. All contractors who came over said that they would be happy to do the project and gave us estimates. When asked about what would happen to the new rooms in 5-6 years, all responded that everything would be just fine. They spent several minutes to inspect the place. When Tim and Allen arrived they looked very carefully at the project and inspected underneath the barn and its second floor. It took them more than an hour inspecting. After that Tim told us his verdict: "If we were here for a "quick buck", we would certainly build these rooms for you, it is an easy project. But it is more than likely that the walls in your new rooms would crack very soon, and sheet rock could event burst in a year or two. This disaster would carry our name on it, and this whole project will be a total waste of your money". They explained to us some architectural peculiarities of the barn, pointing out that the barn's foundation is not stable and is moving all the time. Tim and Allen simply refused to "grab the money and run away" since they cared about their reputation. This fact won our hearts. Tim suggested another architectural solution for our addition -- only slightly more expensive but it would give stability to the new structure for years to come. He explained to us every step of the project and gave us a reasonable price. Now when the project is done we cannot fully express our gratitude to Tim Spry and his crew. The whole process was unbelievably smooth - every single stage of it. Everything was on schedule; in addition Tim did nice little extras for us without charge. Tim stayed exact to every penny in the projected budget. Before I never suspected how much knowledge and various skills one needs to build a house. Tim is very young but don't let his age deceive you. He is extremely professional, knowledgeable and hard- working. Our expectations were not just met -- they were exceeded. I would definitely recommend A-Team to all of my friends. Tim and his team deserve an "A+" grade. Reliable, professional, personable, detail oriented -- these qualities are hard-to-find to be combined in one person today. Excellent quality and great workmanship! Personal note to Tim: Thank you, Tim, for everything. We feel fortunate to get to know you. I am sure we have a lot of projects ahead together. We'll keep you busy and let's stay in touch. I would be happy to give Tim and Allen a reference. Tim and Allen put a mud room onto our house with a closet and storage area underneath. They put the flooring in and did all the trim work, electrical and painting. They also put paneling in our basement. We will continue to have them do odd jobs around our house. They are very honest and trustworthy. They are also very efficent and hard working. On a scale of one to ten, We would certainly give them a 10! I thought my e-mail was already sent. That's why you have two e-mails. yes, I would give them a 10! If you are a recent customer of A-Team Home Improvements please suibmit a refenrece for us that will be posted on this page.